Inhibition of aberrantly activated pathways cross-talking with hormone receptor (HR) improves response to endocrine therapy in patients with HR-positive advanced breast cancer. We performed a Pubmed database systematic review to ascertain the existence of a better clinical response when combining endocrine therapy with targeted agents in the neoadjuvant setting. Preclinical studies or trials evaluating toxicity were excluded. We found nine phase II trials that fulfilled the research criteria. The endocrine agents used were third generation aromatase inhibitors (AIs), anastrozole, letrozole or exemestane. The investigated targeted agents were inhibitors of tyrosine kinase receptors such as gefitinib, imatinib or trastuzumab/lapatinib, inhibitors of mTOR, such as everolimus, inhibitors of COX-2, such as celecoxib, and inhibitors of angiogenesis, such as bevacizumab. The response rate (RR) observed combining endocrine and targeted agents ranged between 36% and 90%. Overall the studies failed to show a remarkable advantage in RR in the combination group compared to historical control subjects receiving AIs alone. Neoadjuvant systemic therapy is strategically used to reduce the primary breast cancer volume and allow either surgery in patients initially judged inoperable [1-3], or conservative surgery in patients who otherwise would have received mastectomy [3, 4-6]. Long-term outcomes of pre- and post-operative therapy are comparable [4, 7-9], but the neoadjuvant approach gives additional information on the antitumor activity of the therapeutic agents and provides a precious biological system, the tumor itself, to study “in vivo” the possible mechanisms involved in the occurrence of resistance. Moreover, patients who achieve a pathologic complete response (pCR) after neoadjuvant treatment, i.e. absence of cancer in breast and nodes, have a very good prognosis [10, 11]. In this scenario, chemotherapy is usually the first choice of treatment for its ability to reach higher rates of pCR, while endocrine therapy is usually reserved for elderly patients with hormone receptor (HR)-positive tumors and affected by comorbidities. Nevertheless, in recent years, neoadjuvant endocrine therapy is increasingly used as primary systemic therapy for postmenopausal women with HR-positive tumors given that this subgroup of patients achieves a low rate of pCR with chemotherapy and maintains, in any case, a favourable long-term outcome [12-16]. In addition, no prognostic advantage from the attainment of pCR has been observed in patients with HR-positive tumors . 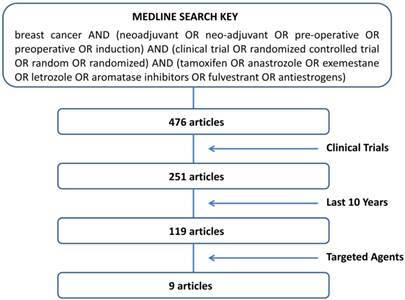 In the neoadjuvant setting, tamoxifen has historically been employed, but the third generation aromatase inhibitors (AIs), including letrozole, anastrozole and exemestane, have been shown to be significantly superior to tamoxifen in terms of overall response rate (RR) and achievement of breast-conserving surgery [18-21]. As for other anti-cancer treatment, tumor might exhibit de novo or acquired resistance to endocrine therapy. The underlying mechanisms are not completely understood, but a major role seems to be played by cross-talks between HR and intracellular signaling triggered by tyrosine kinase receptors (TKRs) [22, 23]. The activation of these molecular pathways might affect tumor response to endocrine therapy. In fact, in preclinical studies, the overexpression of human epidermal growth factor receptor 2 (HER2) in tumor cells significantly reduces the activity of endocrine therapies [24-26]. Similarly, the epidermal growth factor receptor (EGFR) has been associated with endocrine-resistant phenotype , and platelet-derived growth factor receptor (PDGFR) has been shown to be associated with biological aggressiveness of breast cancer . Among the downstream pathways activated by TKRs, the phosphoinositide-3-kinase (PI3K)/Akt signaling pathway, including the mammalian target of rapamycin (mTOR), has been showed to be involved in the resistance of breast cancer cells to endocrine therapy [29, 30]. Moreover, tumor cells might secrete pro-angiogenic factors, such as the vascular endothelial growth factor (VEGF), that in some way could limit hormone therapy efficacy. For example, in animal models the overexpression of VEGF in tumor cells is responsible for tamoxifen resistance . In this altered molecular milieu the inhibition of a driver pathway by specifically designed agents (targeted agents) can restore hormone sensitivity [32-34]. Notably, in some cases, the preclinical research has been translated into clinical practice after confirmatory phase III clinical trials. In particular, the combination of an AI with anti-HER2 drugs, such as trastuzumab or lapatinib, has been demonstrated to achieve longer progression free survival compared to AI alone in postmenopausal women with metastatic HER2-positive breast cancer [35, 36]. In another study, the Bolero-2 trial, the combination of everolimus, a mTOR inhibitor, and exemestane resulted in an increased efficacy compared to exemestane alone in patients with HER2-negative advanced breast cancer who progressed to non-steroidal AI . Differently from the metastatic setting, the neoadjuvant setting is a unique opportunity to assess the relative endocrine sensitivity of a tumor never exposed to a previous hormonal treatment and, therefore, might provide insights on the molecular mechanisms involved on the early occurrence of resistance. The strong rationale and the clinically established benefit of adding a targeted agent to endocrine therapy in metastatic breast cancer prompted us to carry out a systematic review to evaluate a possible advantage of the combination also in the neoadjuvant setting, where a tumor shrinkage is often required to avoid mastectomy. A search of PubMed database on studies combining endocrine therapy with targeted agents in the neoadjuvant setting of breast cancer and published from November 2004 to November 2014 was performed. To limit the research to articles that fulfilled the criteria of “neoadjuvant”, “endocrine therapy” and “clinical trials” we used the sorting key words according to the following algorithm: “breast cancer AND (neoadjuvant OR neo-adjuvant OR pre-operative OR preoperative OR induction) AND (clinical trial OR randomized controlled trial OR random OR randomized) AND (tamoxifen OR anastrozole OR exemestane OR letrozole OR aromatase inhibitors OR fulvestrant OR antiestrogens)”. Further selection was made by choosing “clinical trials” and “last 10 years” in the PubMed database filters. The remaining articles were singly evaluated for pertinence to our objectives. In vitro experiments and animal studies were excluded. Trials that assessed only toxicity (phase I studies) or that included chemotherapy agents in the treatment plan were also excluded. All the studies described herein evaluated clinical response after the neoadjuvant treatment [38-46]. Breast palpation, ecography or mammography were arbitrarily utilized. If not otherwise indicated we refer response to caliper measurements. The clinical response was defined according to the Response Evaluation Criteria in Solid Tumors (RECIST) [38, 40, 43 46] or the Union International Centre Cancer (UICC) criteria [39, 41, 44, 45]: complete response (CR), partial response (PR), stable disease (SD), and progressive disease (PD). One study did not provide the evaluation criteria . The trial selection algorithm is illustrated in Fig. 1. Pubmed database showed a list of 476 articles. Many of them (225) were excluded for the lack of a clinical trial design. In order to focus on the most active endocrine agents currently used in the treatment of breast cancer, we limited the research to the last 10 years. Of the 119 articles resulted by the above restrictions, only 9 dealt with objective response rate (RR) [38-46]. As shown in Table 1, all papers were phase II studies, 4 randomized and 5 non-randomized, incorporating an AI as endocrine agent. In one study fulvestrant was used as well . The table summarizes the types of agent investigated, the period of treatment and the clinical response observed in the studies. The targeted agents utilized in combination with AIs included inhibitors of TKRs, such as gefitinib [38-40], imatinib , or trastuzumab/lapatinib ; inhibitors of mTOR, such as everolimus ; inhibitors of Cox-2, such as celecoxib [44, 45]; inhibitors of angiogenesis, such as bevacizumab . The details of the studies, with particular regard to clinical response, are described below. The sorting key words entered on PubMed and the algorithm followed to select the studies. Gefitinib, a small molecule blocking the tyrosine kinase domain of EGFR, was tested in three different studies. In the first study , patients with HR-positive and EGFR-positive breast cancer were randomized to receive gefitinib 250 mg daily associated with anastrozole 1 mg daily (27 patients) or gefitinib alone (29 patients) for 4-6 weeks. The RR in the combination group was 67%, not significantly different from gefitinib alone (79%), although the combination was more effective in reducing Ki67 labeling index. No pCR was observed. The study does not provide information on the basal activity of anastrozole given that the control arm was gefitinib. AIs aromatase inhibitors, ANA anastrozole, LET letrozole, EXE, exemestane, R randomized study, N number of patients, CR complete response, PR partial response, SD stable disease, PD progressive disease. The second study  randomized 236 women and provided similar results, reporting RRs of 47% and 61% in the combination group (121 patients) and anastrozole alone group (85 patients), respectively. However, the primary endpoint of the study was the change of Ki67 evaluated in tumor core biopsy after 2 weeks and after 16 weeks of treatment. The authors hypothesized that lack of Ki67 reduction after 2 weeks could identify patients whose tumor was resistant to anastrozole and that might be particularly sensitive to the added gefitinib. For this reason the combination group was divided into a group of patients receiving gefitinib 250 mg daily for 16 weeks and a group receiving placebo for 2 weeks, followed by gefitinib 250 mg daily for 14 weeks. The study failed to demonstrate any gefitinib-related difference in both Ki67 reduction and RR. The third study  examined the activity of gefitinib 250 mg daily associated with a potential more effective endocrine treatment combining anastrozole 1 mg daily and fulvestrant 250 mg intramuscular monthly for 16 weeks. The study enrolled 15 patients, 3 of whom withdrew before response assessment. In the remaining 12 patients, RR was only 37%. Rate of pCR was not reported. Imatinib, a potent inhibitor of PDGFR and cKit, was studied in combination with letrozole in a pilot study enrolling 13 women . Patients received preoperatively imatinib 400 mg twice daily and letrozole 2.5 mg daily for 3 months. Three patients withdraw after 8 weeks because of hematoma in tumor or toxicity. Nine out of 10 evaluable patients (90%) obtained a PR and 1 (10%) had SD. One patient (10%) achieved a pCR. The dual block of HER2, obtained with trastuzumab and lapatinib, was studied in 64 patients with locally advanced HER2-positive breast cancer . Patients received trastuzumab weekly (4 mg/kg loading, then 2 mg/kg) and lapatinib 1000 mg daily for 12 weeks. Thirty-nine patients whose tumors were HR-positive were also treated with letrozole 2.5 mg daily. The study primary endpoint was the rate of pCR, which was 18% in the HR-positive group and 28% in the HR-negative group. No data were reported for clinical response, except for a table showing a RR (referred to as non-pCR) of 46% in the letrozole group. Moreover, given that only two patients experienced progression during the study treatment and both were in the HR-negative group, we can extrapolate that 54% of patients in the letrozole group had SD. A phase II, randomized, double-blind, placebo-controlled trial was carried out to evaluate the rate of tumor response combining everolimus and letrozole in the neoadjuvant treatment of postmenopausal women with HR-positive breast cancer . One hundred thirty-eight patients received letrozole 2.5 mg plus everolimus 10 mg daily, while 132 received letrozole plus placebo. Treatment was administered for 16 weeks. The RRs were 68.1% in patients treated with everolimus and 59.1% in patients treated with placebo (p=0.062), a difference considered statistically significant in the one-sided χ2 test. Moreover, the combination arm showed a higher proportion of Ki67 index reduction (57% vs 30%, p<0.01). As expected, the everolimus group had a higher incidence of grade 3 and 4 toxicity compared with the placebo one (22.6% vs 3.8%), and a dose reduction or interruption was required in 52.9% of cases (vs 7.6% in the placebo treated patients). A pCR was reported in two patients treated with everolimus and in one treated with placebo. We found two trials combining AIs with celecoxib, a cyclooxygenase-2 (COX-2) inhibitor. The first study  randomized 82 patients into 3 groups: group A (30 patients) received exemestane 25 mg daily and celecoxib 400 mg twice daily, group B (24 patients) received exemestane 25 mg daily, group C (28 patients) received letrozole 2.5 mg daily. The overall RRs were 58.6% for group A, 54.5% for group B and 62.0% for group C. No significant differences were observed among the three groups, but the combination group included 20% of patients with HER2-positive disease, a molecular phenotype expressed in only 7% and 8% of patients of group B and C, respectively. Moreover, group A showed the highest clinical CR (10%). A pCR was observed only in two (7%) patients of group C.
In the second study  22 postmenopausal women were enrolled and treated with neoadjuvant exemestane 25 mg daily for 8 weeks, followed by exemestane 25 mg daily and celecoxib 400 mg twice daily for 8 weeks. The study had this design because its primary objective was the assessment of changes in the expression of the aromatase enzyme, as well as estrogen receptor, progesterone receptor, HER2, Ki67, and COX-2 in the tumor before, during, and after treatment. The study showed that progesterone receptor and Ki67 significantly decreased by effect of the AI alone (8 weeks) and continued to reduce during combination therapy; estrogen receptor and COX-2 decreased only after combination therapy (16 weeks); HER2 and aromatase enzyme were not affected by treatment. The RR, evaluated at the end of treatment, was 36%. No patient obtained a clinical CR or pCR. A single-arm pilot study was carried out to assess the activity of the combination of letrozole and bevacizumab, a monoclonal antibody inhibiting VEGF, in the neoadjuvant treatment of postmenopausal women with HR-positive breast cancer . 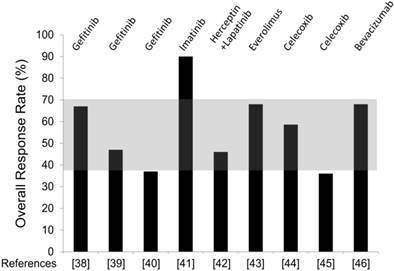 Twenty-five patients received letrozole 2.5 mg daily and intravenous bevacizumab 15 mg/kg every 3 weeks. An objective clinical response was observed in 17 of 25 patients (68%), with 4 CR (16%) and 13 PR (52%). Three out of 4 clinical CR were also pCR (12%). We performed a systematic literature review aimed at assessing if the addition of targeted agents might overcome endocrine resistance and improve clinical response in women with a recent diagnosis of breast cancer treated preoperatively with endocrine therapies. To evaluate the anti-tumor activity of the investigated treatment we focused on clinical response rather than pCR because of the low pCR rate achieved with endocrine therapy, especially in a short-term treatment. We found 9 articles that fulfilled the research criteria. All of them were phase II studies that utilized third generation AIs, in one study combined with fulvestrant, as endocrine agents. Historically, in the neoadiuvant setting, patients treated with AIs achieve RRs ranging between 37% and 70% [18-21]. In the impossibility to make a rigorous meta-analysis of the selected studies, due to small sample size, different duration of treatment and different types of targeted agents, and with the limitations inherent in phase II trials to provide valid conclusions due to selection and confounding biases, we speculate that 70% might be set as a reasonable RR threshold required to presume a clinical benefit of the combination therapy. In our clinical practice we obtained even a higher RR (86%) with neoadjuvant AIs . Overall, the selected studies failed to demonstrate an advantage with added targeted agents over AIs alone. Figure 2 provides an overview of the RR obtained in each trial, and shows how much this value differs from the expected RR (shaded area). It is clear that in all studies but one, RR is within the estimated range, i.e. no advantage. The only study showing an impressive increase of response was the one combining letrozole and imatinib (RR 90%) . However, the study has a very small sample size (10 patients evaluable for response) to allow any firm conclusion. Notably, in this study three patients withdrew for toxicity: one patient developed tumor hematoma and underwent surgery prematurely, two patients experienced acute coronary syndrome and generalized edema. If we recalculate RR on the “intention to treat” population rather than on the evaluable patients, it decreases to 69%, i.e. in the range of no benefit. However, the high RR observed combining imatinib and AI suggests further investigation, advisably with a dose less than 400 mg twice daily (the dose administered in the study), to reduce the potential risk of severe toxicity. The overall unsatisfactory results observed adding preoperatively targeted agents to AIs is quite surprisingly considering the plethora of preclinical studies and the encouraging results in metastatic patients that indicate a synergistic effect. We try to argue possible explanations. First, except for the study on trastuzumab/lapatinib  and one study on gefitinib  in which the expression of HER2 and EGFR in tumor tissue were evaluated, respectively, the targeted agents were utilized without patient selection for a specific molecular target. It is evident that only tumors expressing the functionally altered molecule (the target) might respond to the treatment. Moreover, it is likely that even when a target is identified and the right population selected to be treated, only a proportion might receive a benefit because of unknown co-existing molecular alterations that retain tumor resistance. Therefore, in a heterogeneous population of HR-positive breast cancer it is conceivable that small dimensioned phase II studies might fail their primary endpoint. Overall Response Rate (RR) observed combining AI and targeted agents in the selected trials. The targeted agents utilized in each study are specified in the top. Reference number is placed in the bottom. The shaded area comprised between 37% and 70% depicts the range of RR observed with AI alone in historical studies. Second, tumor in the neoadjuvant setting is different from tumor in the metastatic disease given that the former has never been exposed to chemo/hormonal therapies. This issue is particularly important for the mTOR pathway that seems to be mostly activated in the mechanism of acquired resistance to AI . This is probably one of the reasons for the benefit of everolimus added to AIs in patients previously treated with AIs  and, on the contrary, may partially explain the absence of benefit of temsirolimus, another mTOR inhibitor, in a setting of AI-naïve patients [49, 50]. Third, the hypothesis generating the clinical study might be not true. This is probably the case of celecoxib, a COX-2 inhibitor. The biological rationale to add celecoxib to AIs is that breast cancer self-production of estrogen is relevant for tumor growth. Prostaglandin E2 (PGE2), produced by COX-2, determines high levels of intratumoral estrogen by increasing intracellular cAMP that, in turns, enhances aromatase enzyme synthesis. COX-2 overexpression, high levels of PGE2 and increased aromatase activity have been observed in breast cancer [51, 52]. However, the contribution of tumor synthesized estrogens to the breast cancer estrogen levels is negligible compared to systemic production. Intratumoral estrogens come mainly by circulatory uptake and, therefore, reflect plasma estrogen concentration . For this reason reducing local estrogen synthesis could be not effective. Finally, the duration of treatment might be too short. It has been reported that the longer is the neoadjuvant endocrine treatment the higher is the overall RR . Rimawi et al. (S. Antonio 2014) showed that longer treatment with dual anti-HER2 therapy (trastuzumab plus lapatinib) in combination with endocrine therapy and without chemotherapy leads to a meaningful increase in pCR rate in HR+/HER2+ breast cancer (33% with 24 weeks vs 9% with 12 weeks of therapy) . In most of the presented studies, patients were treated for no more than 4 months, and in some cases for just a few weeks. Furthermore, RR might not be the only indicator of efficacy, especially for long-term outcome. Parameters such as Ki67 reduction, depth of response, or achievement of pCR could be relevant in regimens containing targeted agents. A significant reduction in Ki67 was observed adding gefitinib  or everolimus  to AI. Moreover, high rates of pCR were reported using AI with trastuzumab/lapatinib or bevacizumab, 18% and 13% respectively. This is particularly impressive for a nonchemotherapy-containing regimen, considering that hormone therapy alone rarely achieves pCR [56-58]. At the moment we do not know if the higher rates of Ki67 reduction or pCR observed with these targeted therapies might translate in a better clinical outcome. In conclusion, thus far, in the breast cancer neoadjuvant setting, the attempts to increase endocrine response by targeting specific intracellular pathways have been disappointing. Further studies are needed for a better knowledge of the complex mechanisms responsible for “de novo” or acquired hormone resistance. The identification of a specific molecular target and a strict selection of HR-positive patients to treat are still the future challenge to improve endocrine responsiveness. AI: aromatase inhibitor; BCS: breast conserving surgery; CR: complete response; EGFR: epidermal growth factor receptor; HER2: human epidermal growth factor receptor 2; HR: hormone receptor; mTOR: mammalian target of rapamycin; PD: progressive disease; pCR: pathologic complete response; PDGFR: platelet-derived growth factor receptor; PR: partial response; RR: response rate; SD: stable disease; TKR: tyrosine kinase receptor; VEGF: vascular endothelial growth factor. This work was supported from the Consorzio Interuniversitario Nazionale per la Bio-Oncologia (CINBO) and institutional funding from 'G. D'Annunzio' University.